Barcelona secured two late goals to beat struggling Rayo Vallecano in a remarkable game, extending their lead at the top of La Liga to four points. Luis Suarez put Barca ahead from Jordi Alba's cutback, but Jose Pozo equalised with an excellent 25-yard shot. Substitute Alberto Garcia tapped home with his first touch as Rayo looked set for a second La Liga win of the season. 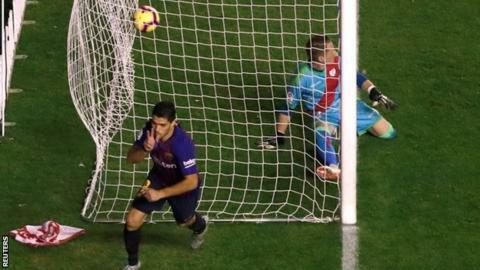 But Ousmane Dembele's sweet half-volley and Suarez's last-minute strike turned it round once again. Barcelona are now four points above Atletico Madrid, who drew 1-1 at Leganes on Saturday afternoon, and Alaves, who visit Eibar on Sunday (11:00 GMT). For a long time it looked as though they were going to suffer a first defeat against Rayo Vallecano since 2002 - but they have now beaten them for the 12th game in a row. With Barca on the ropes, centre-back Gerard Pique played as an auxiliary forward and headed a cross into Dembele's pass for a late equaliser - before Suarez stabbed home Sergi Roberto's deep cross at the back post in the final minute. That was his fifth goal in two games, having scored a hat-trick last Sunday in the 5-1 win over Real Madrid, and it means Barca have now won five games in a row in all competitions. Madrid's third biggest team Rayo had looked on the verge of a famous win after turning the game around following Suarez's opener. Moments after missing a sitter, former Manchester City youngster Pozo fired a brilliant effort beyond Marc-Andre ter Stegen from outside the box. Pozo had not been named in the initial line-up, with Alvaro Garcia due to start. But a late change saw Garcia on the bench instead - and when he did come on, he scored 40 seconds later. Raul de Tomas' header hit the post, rolled across the goal and was tapped home at the back post by the winger. His previous league goal had been against Barcelona B - last season for Cadiz in the second division. They bravely pushed for a third before eventually being heartbroken - although Luis Advincula almost scored an injury-time equaliser, with his header saved by ter Stegen. They remain second bottom of La Liga, with one win from 11 games. Match ends, Rayo Vallecano 2, Barcelona 3. Second Half ends, Rayo Vallecano 2, Barcelona 3. Attempt saved. Luis Advíncula (Rayo Vallecano) header from the right side of the six yard box is saved in the bottom right corner. Assisted by Adrián Embarba with a cross. Foul by Munir El Haddadi (Barcelona). Adrián Embarba (Rayo Vallecano) wins a free kick in the defensive half. Goal! Rayo Vallecano 2, Barcelona 3. Luis Suárez (Barcelona) right footed shot from the left side of the six yard box to the bottom left corner. Assisted by Sergi Roberto with a cross. Foul by Álex Alegría (Rayo Vallecano). Alberto García (Rayo Vallecano) is shown the yellow card. Goal! Rayo Vallecano 2, Barcelona 2. Ousmane Dembélé (Barcelona) left footed shot from the right side of the box to the bottom left corner. Assisted by Gerard Piqué with a headed pass. Attempt saved. Luis Suárez (Barcelona) header from the centre of the box is saved in the bottom left corner. Assisted by Jordi Alba with a cross. Attempt missed. Munir El Haddadi (Barcelona) header from the centre of the box misses to the left. Assisted by Ousmane Dembélé with a cross. Attempt saved. Luis Suárez (Barcelona) left footed shot from the left side of the box is saved in the centre of the goal. Assisted by Munir El Haddadi with a through ball. Álex Alegría (Rayo Vallecano) wins a free kick in the defensive half. Attempt saved. Giannelli Imbula (Rayo Vallecano) left footed shot from outside the box is saved in the top right corner. Substitution, Rayo Vallecano. Emiliano Velázquez replaces Alejandro Gálvez because of an injury. Delay in match Alejandro Gálvez (Rayo Vallecano) because of an injury. Attempt missed. Giannelli Imbula (Rayo Vallecano) left footed shot from the centre of the box is close, but misses to the right. Assisted by Álex Alegría. Substitution, Barcelona. Munir El Haddadi replaces Coutinho. Attempt saved. Adrián Embarba (Rayo Vallecano) right footed shot from a difficult angle on the right is saved in the centre of the goal. Substitution, Rayo Vallecano. Álex Alegría replaces Raúl de Tomás. Corner, Rayo Vallecano. Conceded by Jordi Alba.